Have you ever worried about your mailbox filling up while on long business trips or vacations, or in other situations when downloading your mail isn't possible? Mail Plus service was designed to alleviate this bane to current day E-mail by allowing you to increase your mailbox capacity from 20MB to 3GB. A larger mailbox opens up a whole new world of possibilities and can even be used with both IMAP and standard POP3! Your mail is safely stored on Rakuten Broadband Premium's server even during long periods of inactivity and when receiving mail with large attachments. Unlimited storage period and mail count. Optimum performance even when the same mail account is being accessed from different locations and by multiple persons. Compatible with POP3 standard as well as IMAP*! Can be used with your additional mailboxes too! E-mail protocol that allows one E-mail account to be accessed from multiple locations and individuals. Unlike POP3, Mail and Folders are stored and managed directly from the server. 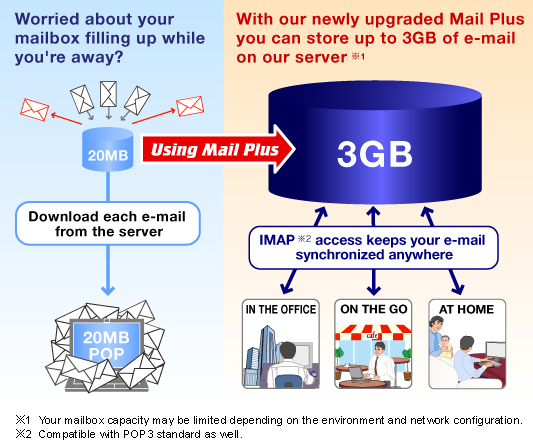 With the extra capacity of Mail Plus, IMAP is the protocol of choice.